The important build Alpha 3.0 di Star Citizen seems to have been public but is not currently available to all users. The doubt lies in the fact that the first external phase of the test was made by a supergroup of Star Citizen community members known as The Evocati Test Flight, which are under NDA and can not, at this time, speak. A post from the group forum and republished on Reddit announced the arrival of the new release. "We are absolutely excited to announce that the 3.0 version is now available for Test Evocati on PTU [Public Test Universe]". You can also find a copy of the post, deleted shortly, at following link. Evoked tests will probably continue for a couple of weeks depending on which bugs and problems will be identified. From there, the alpha 3.0 will enter the restricted PTU tests before gradually expanding to include more and more people. Finally, once all the problems have been met satisfactorily, Cloud Imperium will send the 3.0 to the mass. It is at this point that Star Citizen will resemble, more or less, an Early Access release. 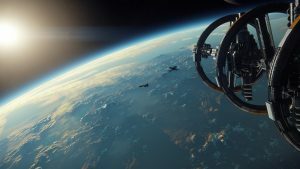 By paying 45 dollars you will get a Starter package and you can safely start playing, even if Chris Roberts said that the price of Star Citizen could go up "a little" when the 3.0 version arrives. next articleWhat Happens to Your Steam Account When You Die?